Visually impaired people face many problems in their day to day lives. Among them, outdoor navigation is one of the major concerns. The existing solutions based on Wireless Sensor Networks(WSN) and Global Positioning System (GPS) track ZigBee units or RFID (Radio Frequency Identification) tags fixed on the navigation system. The issues pertaining to these solutions are as follows: (1) It is suitable only when the visually impaired person is commuting in a familiar environment; (2) The device provides only a one way communication; (3) Most of these instruments are heavy and sometimes costly. Preferable solution would be to make a system which is easy to carry and cheap. The objective of this paper is to break down the technological barriers, and to propose a system by developing an Android App which would help a visually impaired person while traveling via the public transport system like Bus. The proposed system uses an inbuilt feature of smart phone such as GPS location tracker to track the location of the user and Text to Speech converter. The system also integrates Google Speech to Text converter for capturing the voice input and converts them to text. This system recommends the requirement of installing a GPS module in buses for real time tracking. With minor modification, this App can also help older people for independent navigation. Keywords: — Blind Aid; Android App; GPS module; Google Speech to Text converter. We use buses for traveling from one place to another, but it would be difficult to locate the correct bus if we are commuting in an unfamiliar environment. Now, imagine the case of a visually impaired person. The task of finding a way in such an environment for an unassisted person with visual impairment becomes nearly impossible. Navigation tends to be more difficult because the environment is so homogeneous. This problem of outdoor navigation remains largely unsolved. 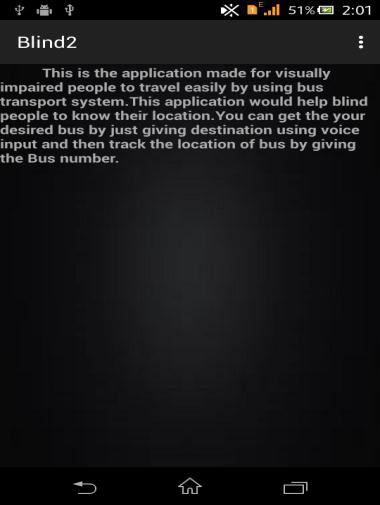 So, the objective of the paper is to propose a system and develop a Mobile App, which could help a blind or visually impaired person to navigate in outdoor areas via public transport systems independently. This App would act as a medium between the visually impaired and the society. The App first tracks the location of the user via GPS and accept their destination via Google Speech to Text converter. 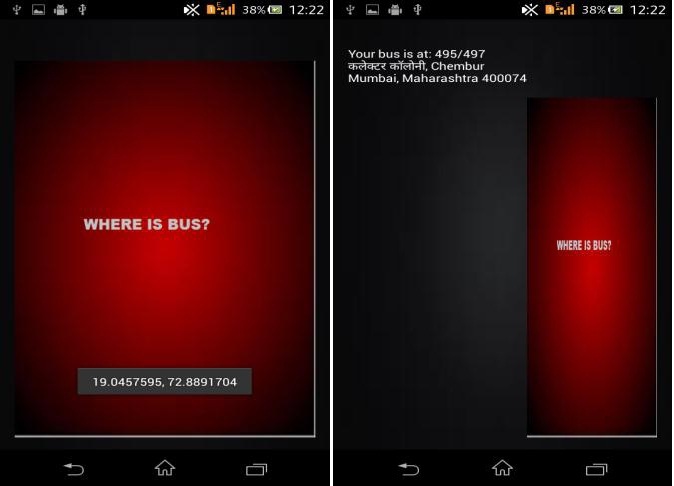 Based on the extracted destination, it retrieves the buses and guides the user. In case of danger or emergency, the App sends an auto-message to the emergency contact number, mentioning the current location of the user. The paper is organized into five sections. Section 1 covers, the motivation behind selecting the topic and developing such a Mobile App. Section 2 summarizes the literature review carried out to understand the existing systems in the domain. Section 3 elaborates the architectural details of the developed App with its working in detail. Section 4 illustrates the implementation details with the snapshots of the Mobile App. Section 5 concludes the paper by briefing the findings of the study and highlights the future scope. (2) Server side modules along with GPS (Global Positioning System). The working of the two modules associated with the Client side are : (1) User Module: It is installed on the smart phone of the user. When this module is activated, it automatically tracks the location of the user via GPS Locator, every 3 seconds. This information is then transferred to the Server along with the destination uttered to the module via Google Speech to Text converter. (2) Bus Module: This module tracks the location of the bus and updates the Server, every 3 seconds as latitude and longitude. Admin module, the Server side module which governs the bus database and the updates it. This module answers the query posted from the client modules which are connected in the network. 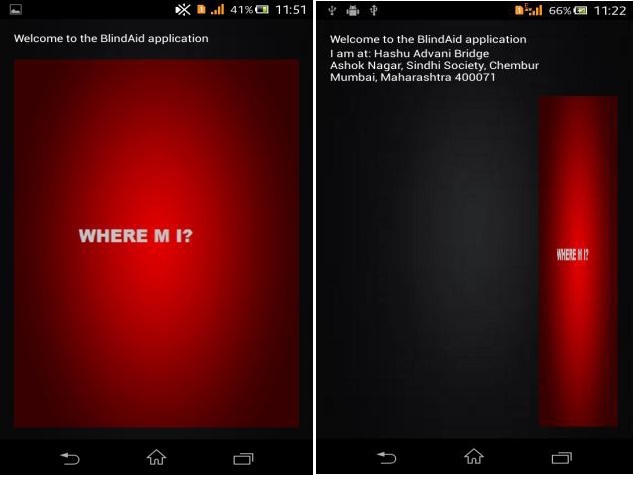 This section briefs the implementation details involved while developing Blind-Aid App. Sub-section 3.1, describes the actual methodology used with respect to all the modules and sub-section 3.2, details the working of the App with snapshots. The system was developed using a GPS enabled smart phone. Android provides a more scalable platform than any other mobile OS and is more user friendly, hence application was built using Android  framework. A server with a database is needed to maintain the user details, all the bus requests and also for adding and deleting buses. 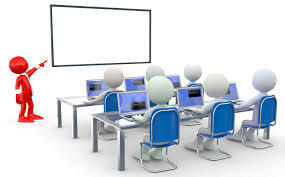 Hence, server was hosted on www.000webhost.com  with a MySQL database and PHP connectivity. Figure 2(a) depicts the Home Screen of the Blind-Aid App. The user opens this App by tapping on the Blind-Aid App icon. Then the user is presented with four options. The four options are; (1) Bus Number; (2) Bus Track; (3) Auto-messaging and (4) About Us. Figure 2(b) renders the UI for voice command. This UI accepts the voice command as input from user for selecting any one of the above mentioned options. This UI is automatically activated as soon as the App is initiated, so as to facilitate blind users. The user selects Bus Number option, when he/she wants to get details about a bus from the current location to the required destination. After selecting this option, the user is prompted with the screen shown in Figure 3(a). When the user taps on this screen, the GPS location of the user is tracked and displayed as shown in Figure 3(b). This step is required to track the source of user for further processing. Next step is to accept the destination from user. Figure. 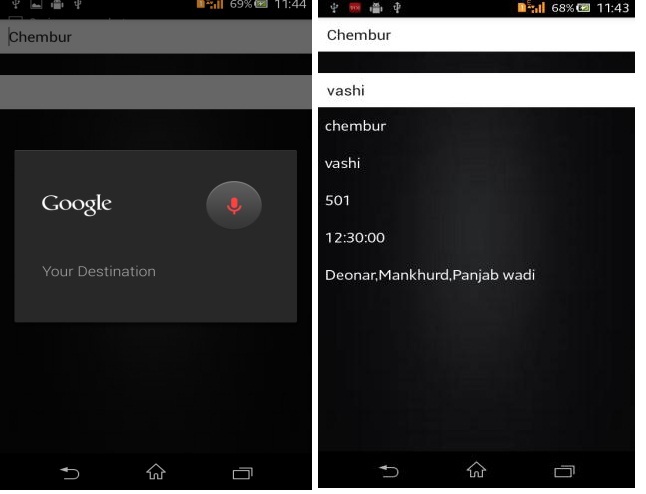 4(a), depicts the UI for inputting the destination through voice command. Once the source in the previous step is tracked and desired destination is converted to text, the User module forwards a query to the Admin module to track the bus details. Figure. 4(b) depicts the bus details retrieved from the database. When the user wants to gather details of a particular bus, he/she selects the Bus track option from the Home Screen. Figure 5(a) renders the screen that appears when this selection is made. 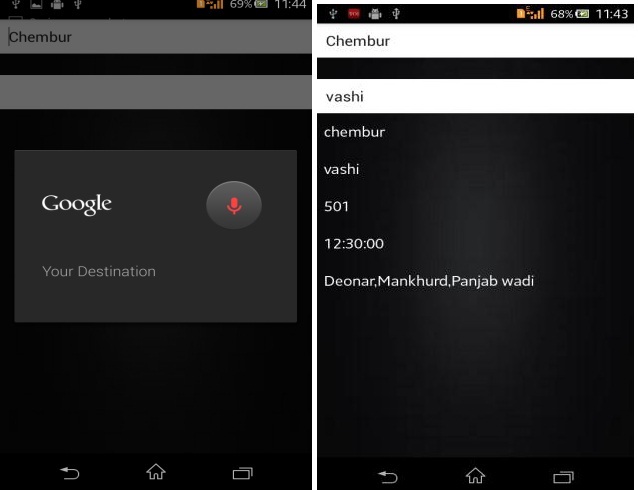 Through voice command user enters the Bus Number which they want to track. Figure 5(b) renders the screen displaying current location about the Bus Number uttered by the user. This current location is represented as latitude and longitude. 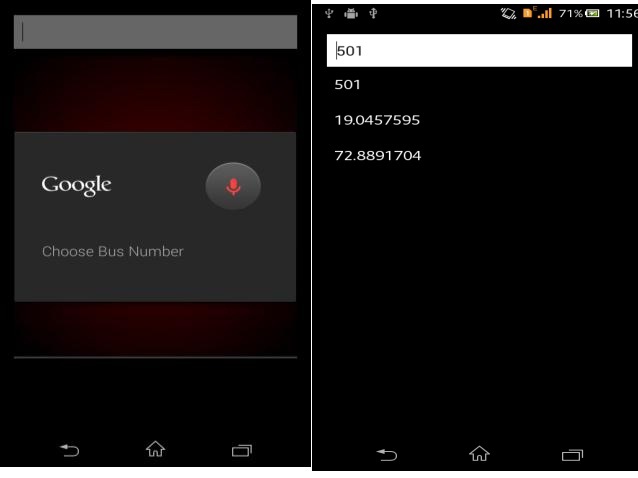 For tracking the current location of the Bus, the user utters the Bus Number in the UI shown in Figure 6(a). 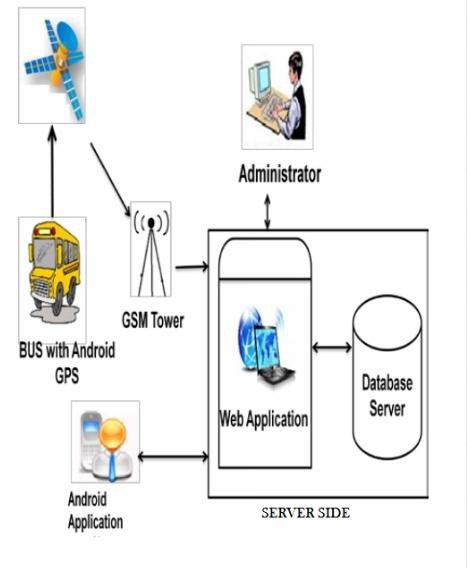 Once user taps on the screen shown in Figure 6(a), the GPS address of Bus location is retrieved by the Server after interacting with GPS module of the concerned Bus. The resulting screen is shown in the Figure 6(b). The Auto-messaging module in this App, is an additional feature which can be used for sending message to emergency contacts, in case the user come across with an accident or when he/she is lost in the strange environment. This message includes the current location of user for easy tracking. Figure 7(a) shows the screen that appears, when user selects Auto-Messaging option, from the Home Screen. The location details of the user is retrieved from the GPS module and a message is automatically generated as shown in Figure 7(a). 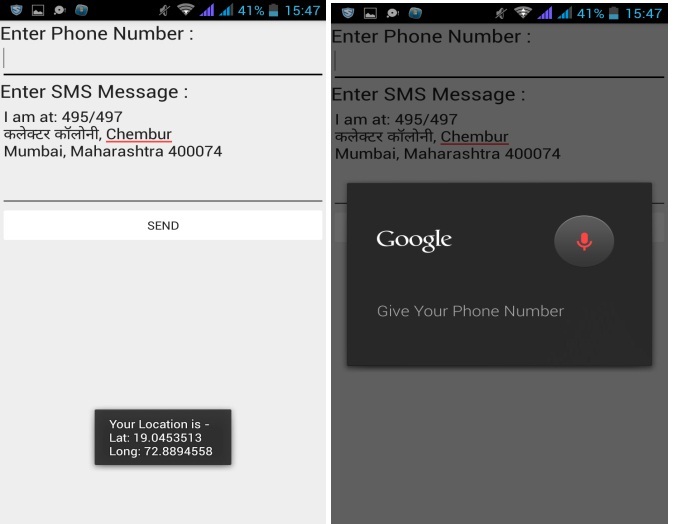 Then, the user is prompted to enter the emergency phone number as shown in Figure 7(b). Voice input is given by the user via Google Speech to Text converter. 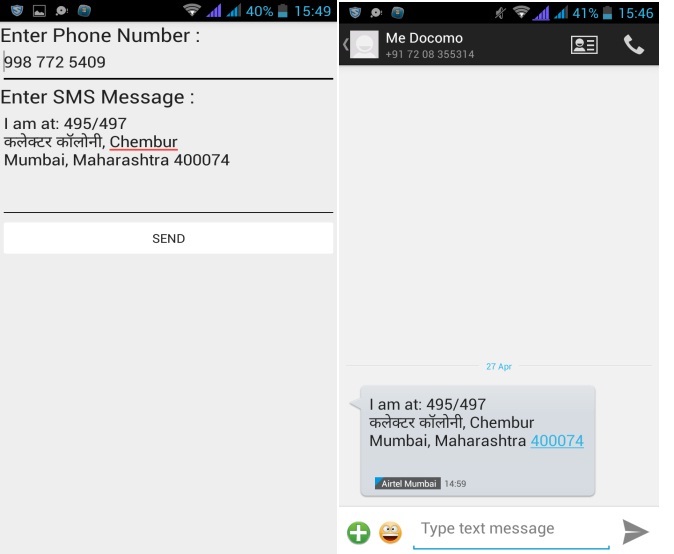 After giving contact number as input, the message is now ready to be sent. The auto generated message, is then forwarded to concerned number. This is depicted in Figure 8(a), where the user needs to tap on send button to proceed. Figure 8(b) depicts the message received on the emergency contact number. This message includes current location of the user. About Us is the last option on the Home Screen of App. Figure. 9 is the screen that appears, when user selects the respective option. The UI displays the information about the App; and also provides a voice output for the text.About Us is the last option on the Home Screen of App. Figure. 9 is the screen that appears, when user selects the respective option. The UI displays the information about the App; and also provides a voice output for the text. (8) App can be easily installed on all Android mobiles. (3) Uninterrupted internet connection is required for voice recognition and data fetching; (4) Recommends a GPS module to be installed on all buses. (4) Extend the App for other transport systems (e.g. Train), in near future. Gulati, R. (2011). GPS Based Voice Alert System for the Blind. International Journal of Scientific and Engineering Research, 2(1), 1-5. Loomis, J. M., Golledge, R. G., & Klatzky, R. L. (1998). Navigation system for the blind: Auditory display modes and guidance. Presence: Teleoperators and Virtual Environments, 7(2), 193-203. Mishra, R., & Koley, S. (2012). Voice Operated Outdoor Navigation System For Visually Impaired Persons'. International Journal of Engineering and Technology, 3(2), l53-157. Lavanya, G., Preethy, W., Shameem, A., & Sushmitha, R. (2013, March). 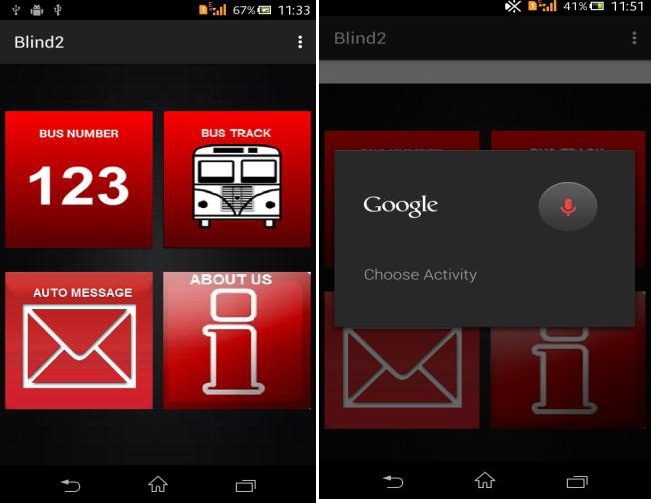 Passenger BUS alert system for easy navigation of blind. In Circuits, Power and Computing Technologies (ICCPCT), 2013 International Conference on (pp. 798-802). IEEE.